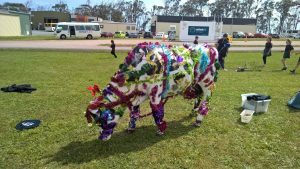 East Devonport Primary visit to decorate our cow. 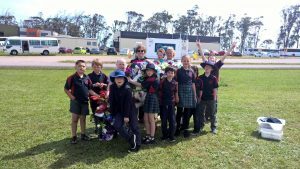 Home/Community/East Devonport Primary visit to decorate our cow. This morning a group of East Devonport Primary School children came out to our depot to decorate our cow for Christmas. They did a fantastic job. She’s covered from the tip of her nose to the end of her tail with tinsel. So they named her Tinsel. If you drive past our depot any time from now until Christmas, have a look at Tinsel the cow. Thank you everyone from East Devonport Primary. We hope you enjoyed your morning.